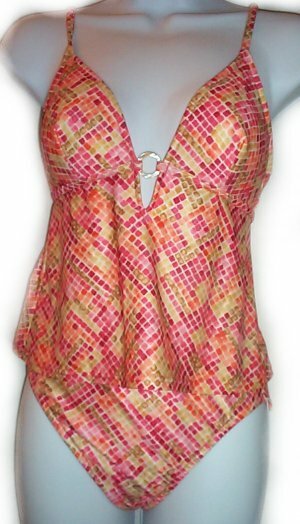 Coral / red tile look 2 piece tankini by I.N.C., International Concepts. Low cut front with mother-of-pearl look ring at bustline. Bra area is fully lined. Bottoms are average coverage and are fully lined, front and back. Misses/Juniors Extra-Small. BRAND NEW!